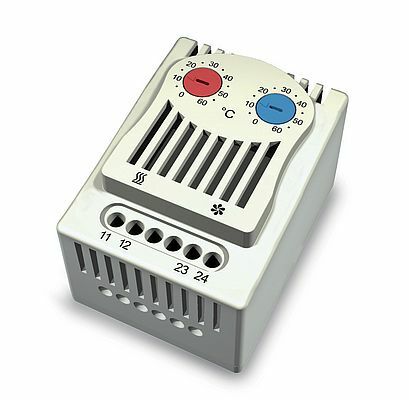 In the field of ambient control in the enclosures, Fandis proposes a series of mechanical thermostats and hygrostats suitable for DIN rail to combine with ventilation systems and anti-condensation heaters to control humidity and temperature. The bimetal thermostats are available fitted with close-on-rise (NO) or open-on-rise (NC) contact. They are notable for a wide setting range (from -10°C to +80°C) and a narrow switch temperature difference. The hygrostats offer a setting range from 10 to 90% relative humidity with an operating and storage temperature up to 60°C. The family enlarges with a new solution for the thermoregulation: the dual thermostat to control independently and simultaneously an heater and a fan, thanks to two regulators in the same casing.